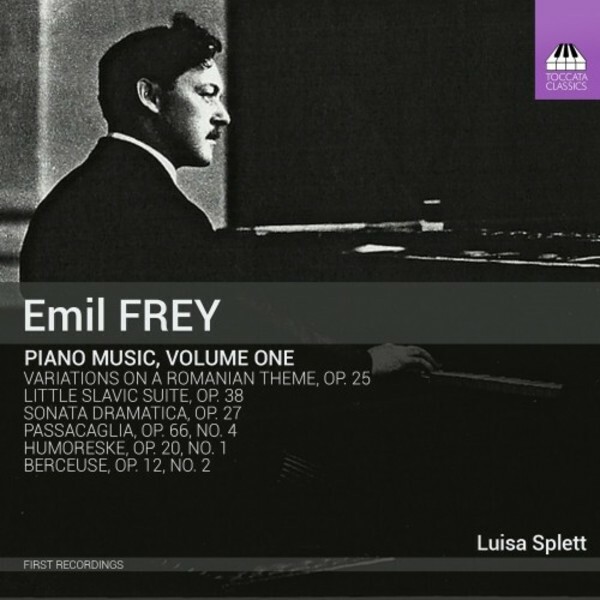 The music of the Swiss pianist-composer Emil Frey (1889–1946) is dark, dramatic, exciting – and completely unknown. His works reflect the stages of his career: study with Fauré, friendship with Enescu, teaching in pre-Revolutionary Russia and mature familiarity with developments back in Western Europe. One work on this CD, the Variations on a Romanian Folksong, dates from his time (1910–12) as court pianist to King Carol I of Romania. Frey’s music has not yet been given any sustained exposure in recordings, and this first survey of his piano music – played by the person who knows it best – reveals a virtuoso’s understanding of the instrument and a sense both of drama and of fun. Luisa Splett is an internationally recognised Swiss pianist. Born in Winterthur in 1983 to a family of musicians, she launched her piano career at the age of five and gave her first solo performance at seven. After a first degree in Zurich, in 2007 she moved to Saint Petersburg for postgraduate studies under the tutelage of Oleg Malov at the Rimsky-Korsakov State Conservatoire. Since October 2012 she has lived in Berlin as an independent artist and teacher. Beside her performing career, she is working on a dissertation at the Universität der Künste Berlin (UdK) on Emil Frey and his pedagogical influences on the pianists of his time and beyond.